Best Uses for STA-BIL Rust Stopper | Gold Eagle Co.
Metal is one material that’s known for being strong, but it’s not indestructible. After all, it’s susceptible to rust if you leave it outside exposed to the elements. Fortunately, there is one way to reduce the odds that your metal belongings will be destroyed by rust over time, and that’s by using STA-BIL Rust Stopper. It really is as simple as spraying this product on the metal items you want to protect from corrosion. Here’s how this product works and where you should use it to prevent rust. When you leave metal items outside for any length of time—whether weeks or years—you run the risk of ending up with rust on the surface. It’s just a fact of life, especially in an area where it rains a lot or even simply gets humid. Short of keeping all metal items inside your house, there’s not much you can do to avoid this issue…unless you add a protective coating to any metal surface in order to prevent rust and corrosion. And that’s exactly what STA-BIL Rust Stopper does. When you spray this product on any metal items you own, you get long-lasting protection through a film coating that is resistant to water. The result is that you can prevent rust from forming on the metal. If you already see some rust on the surface, spraying STA-BIL Rust Stopper on it will stop it from spreading. Plus, this product can lubricate all kinds of metal items to stop the joints from squeaking or sticking. No matter what kind of metal items you’re storing on your property, you’ll appreciate these benefits! Metal patio furniture: If you have a set of table and chairs made out of any type of metal, you’ll find that it will eventually rust after months of being outside, whether it rains or is just humid. Spraying STA-BIL Rust Stopper on all exposed surfaces will keep the metal looking and feeling practically new for years. Metal outdoor equipment: Most power equipment has metal on it, from chainsaws to snowblowers. If you want to keep these expensive items operating at their best, they need a coat of STA-BIL Rust Stopper. Gardening tools: If you keep your rake or shovel outside on your property—or even in a shed—there’s a good chance any moisture in the air will slowly corrode the metal over time. Keep these tools in good condition by spraying a protective coating on them before they rust. Metal grill: There’s nothing worse than going outside to grill, only to find that your barbecue is practically rusted shut. You can avoid this issue with STA-BIL Rust Stopper, which will keep your grilling equipment looking good. Rust Stopper for Cars: Just about every type of vehicle can benefit from STA-BIL Rust Stopper. From car bumpers to bicycle chains, you can stop corrosion on the surface with this product. It can even help motorcycles and tractors avoid becoming rusted over time, saving you a lot of money in the long run! 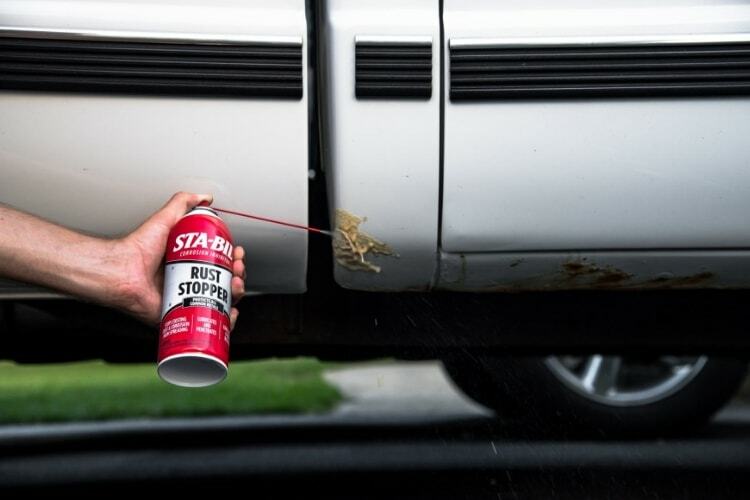 One of the best parts about STA-BIL Rust Stopper is that it’s easy to use. Just shake the can well, and then start spraying the metal surface from about three inches away. Be sure to move the can back and forth evenly to ensure you coat every part of the metal surface with this spray. Note that if you’re in a pretty dry climate, applying STA-BIL Rust Stopper every six months or so should be fine. But if it’s rainy or humid where you live, apply it to metal surfaces on your property about every two months for best results.